Senior defensive end Brady Hart suffered a sprained left ankle and sprained MCL in his left knee and according to Yale coach Jack Siedlecki, Hart could miss 2-4 weeks. Converted defensive back Travis Henry and Max Newton figure to split time at left defensive end in Hart's absence. The availability of reserve tailback Ricky Galvez won't be known until later in the week. Galvez missed the Cornell game with a tender hamstring. Galvez ran for 86 yards in the 2007 win over Holy Cross. Although senior Ryan Fodor saw the majority of action in the second half against Cornell, Siedlecki is not abandoning the two-quarterback system just yet and said he went with Fodor because the former Hand High All-Stater had more familiarity with the offense especially when Yale went into its two-minute drill in the fourth quarter. Two of Holy Cross' best defensive players - senior linebackers Evan Byrd and Ryan Stewart appear to be healing quickly enough from knee injuries to be ready for Yale on Saturday. Byrd was held out of the Georgetown game while Stewart has missed the first three games for the Crusaders. Saturday's 12:30 p.m. game will be Youth Day at the Yale Bowl. Assuming the weather cooperates, players from Wexler/Grant Community School and Roberto Clemente will take part in a game at the Bowl. Also, the first 2600 kids from the New Haven Public School system through the gates will receive a free megaphone. The weekly Football Championship Subdivision NCAA stats are out and senior safety Steve Santoro is tied for second in interceptions with two in two games. Former Cheshire High star and Holy Cross senior Kyle Mushaweh is among the players Santoro is tied with at 1 interception per game. Tom Mante is 13th nationally in punting at 43.25 per punt. Ryan Fodor is 26th with a 138.0 passing rating. Perhaps the most stunning stat is that Yale is 110th out of 118 teams in rushing offense and if you include the five schools still in the provisional category, the Bulldogs are 114th out of 123 teams. Yale is 11th in passing offense. Something tells me that those numbers will have to change if the Bulldogs hope to stay in the Ivy League race. The Ivy League awards are out. Larry Abare (12 tackles, one pass breakup) and Gio Christodoulou (71 yard punt return for a TD) were named to the honor roll. Only problem is no time on the live stream, but the WELI radio crew is in sync with the stream. Not if only the Yale offense can get more in sync. Senior running back Mike McLeod can move up in the Ivy League record book in several categories today. With 93 yards he will move by former Princeton star Judd Garrett and into seventh place with rushing yards in Ivy League games. With 140 yards he will pass 1980s Cornell star Derrick Harmon for the No. 6 spot. One rushing TD will move McLeod into a third-place tie with ex-Cornell star Ed Marinaro on the charts for TDs in all games. Three TD runs would allow McLeod to tie ex-Brown star Nick Hartigan for the No. 2 spot. The three touchdowns would also move McLeod into a tie for third for running TDs in Ivy League games. With kickoff just about a half hour away, just went through the list of players who made the trip. The only player on the two-deep chart on the pre-game notes not here is junior backup running back Ricky Galvez who is out with a hamstring injury. The only freshmen to make the trip are defensive back Drew Baldwin, running back Alex Thomas and defensive lineman Jake Stoller. Senior safety Larry Abare has been cleared to play for Saturday's Ivy League opener at Cornell. Abare was knocked out of Saturday's win over Georgetown with a concussion. Reserve running back Ricky Galvez, who ran for 37 yards and caught four passes against Georgetown, will not play because of a hamstring injury. Galvez's absence should lead to more playing time for junior Brandon Scott and possibly for former Ansonia High star Alex Thomas backing up Mike McLeod. Cornell has at least one edge in Saturday's Ivy League opener against Yale as the Big Red lead in the State College Area High School football alumni count 3-2. Backup quarterback Ben Ganter, reserve receiver Matt Kenney and defensive back Doug Suhey played with Yale senior defensive end Brady Hart and sophomore quarterback Brook Hart at the Pennsylvania high school powerhouse. As a matter of fact, the starting quarterbacks at State College in 2004, 2005 and 2006 were Brady Hart, Ganter and Brook Hart. "(Ganter) was the quarterback after me and before Brook so there is a connection right there because he is one of our best friends. It is always interesting playing Cornell with a bunch of the same people." Senior safety Larry Abare, who was knocked out of the Georgetown game with a concussion, was examined on Sunday and Abare tested at nearly 100 percent on his baseline test, an examination used to clear any players with head injuries. Saturday's 1 p.m. game will be the first football game with new field turf at Schoellkopf Field. Considering that Yale coach Jack Siedlecki said that this is the fastest defense has had, could the fast track work to Yale's advantage? Weekly awards need not to be taken too seriously but it was curious that Yale junior punter Tom Mante wasn't named the Ivy League Special Teams Player of the Week. Mante punted three times for 52 yards, his second punt was a 71-yarder and his final punt not only went for 46 yards, but was downed at the 3. He also kicked two field goals and made a tackle. Let's start with the disclaimer that the numbers are the result of one game against an overmatched Georgetown team, but I couldn't help but notice that Brook Hart and Ryan Fodor currently are No. 1 and 2 in the passing efficiency ratings in the NCAA's Football Championship Subdivision database. Hart, who was 14 of 18 for 176 yards and 3 touchdowns, has a QB rating of 214.9 while Fodor (10 of 15, 185 yards and a TD pass) has a 192.3 QB rating. Joe Hathaway is tied with fellow Ivy Leaguers Matt Curtis of Harvard and James Develin of Brown with 3 1/2 tackles for losses while Tom Mante is tied for first with an average of two field goals a game. He would be leading the nation in punting with a 52-yard average but his three punts weren't enough to qualify for the ratings. Sophomore receiver Jordan Forney is fourth with an average of 136 receiving yards a game and tied for second in scoring at 12 points a game. In the team ratings, Yale is first in total offense, scoring offense and passing efficiency, second in passing offense, scoring defense and net punting, fourth in rushing defense and sixth in total defense. It was curious that the No. 2 team in passing efficiency is the same Bucknell team which played Cornell last year. Yale will be playing Cornell Saturday at 1 p.m. in the road and Icy League opener. Needless to say, there were few complaints after Yale opened the 2008 season with a 47-7 win over Georgetown Saturday at the Yale Bowl. Quarterbacks Ryan Fodor and Brook Hart combined for 361 yards and four touchdowns, the defense was led by nose tackle Joe Hathaway (2 sacks, 3 1/2 tackles for losses, one forced fumble) and Bobby Abare (seven tackles) and the special teams chipped in as Tom Mante not only kicked the first two field goals of his Yale career but had a 71-yard punt and average 52 yards on three punts. On the injury front, the only major news was safety Larry Abare being knocked out of the game with a concussion. Expect a bit more resistance when Yale opens Ivy League play with a game at Cornell Saturday. Cornell won 21-20 over Bucknell on a blocked extra point by Graham Rihn. Nathan Ford passed for 207 yards and two touchdowns while Randy Barbour ranfor 114 yards and a score. Former Amity star Ricky Ballou had three tackles including a sack for the Big Red. On Sunday the Yale JV team defeated Springfield's JV squad 54-0. Former Ansonia High star Alex Thomas ran for 110 yards including a 54-yard TD, Marcus Wallace and Dan Walsh returned fumbles for TDs and Rodney Reynolds had a touchdown run and reception. Bruising junior running back Jordan Farrell will miss the season because of a shoulder injury. While the Bulldogs have plenty of depth behind Mike McLeod at tailback, players like Ricky Galvez, Brandon Scott and Alex Thomas are speed backs and don't offer the ability to move the pile like Farrell does. Of course Yale does have a pretty good short-yardage runner named Mike McLeod. Madison's Ryan Fodor will be the starting quarterback for Yale in Saturday's season opener against Georgetown but he will have some company. Sophomore Brook Hart will also see time at QB for the Bulldogs. Unlike Georgetown which will change QBs in the middle of series, Yale will have the same quarterbacks for an entire series but both Fodor and Hart will be given the chance to distance themselves from the other. Should be interesting to say the least. Yale is waiting on results from the MRI on Jordan Farrell's ailing shoulder. Farrell is questionable for Saturday's game. Other than Farrell's uncertain status, Yale is in pretty good shape health wise. Yale received 87 votes and is 30th in the Sports Network's FCS poll (writers). Harvard was 26th, dropping out as most Ivy teams do early on because people tend to reward those that are playing at the time. Yale got 36 votes and was 27th in the Any Given Saturday poll (coaches). Harvard was 24th. Took in the scrimmage between the Yale junior varsity team and the New Haven varsity squad. Freshmen quarterbacks Bryan Farris (14 of 20, 166 yards, 2 TDs) and Dawson Halliday (6 of 9, 56 yards, 3 TDs, 22 yards rushing) looked very good. Freshman receiver Chris Morris had two of the TD catches. Sophomore DB Marcus Wallace returned an interception 65 yards for a TD and finished with five tackles. Freshman DE Matt Battaglia had five tackles and an interception. Freshman LB Jordan Haynes had six tackles including a highlight-variety shot on UNH QB Cory Pfaff which went down as a sack and a forced fumble. Classmate Carter Deutsch recovered the fumble. Freshman RB Alex Thomas of Ansonia ran 10 times for 55 yards, caught two passes, had a 13-yard punt return and 22-yard kickoff return. Bear in mind that Yale was playing a New Haven team which is restoring its football program and won't play its first varsity game since the program was reborn until next fall but there were plenty of bright spots in the 40-7 win. Going back to varsity, don't expect any announcement on the Yale starting QB until Tuesday. Senior Ryan Fodor and sophomore Brook Hart are running neck and neck and both have played well in the preseason. The spirited competition should benefit whoever gets the call to run the Yale offense. Anybody interested on how the freshmen look can take a ride to Clint Frank Field tomorrow when the Yale JV squad plays the University of New Haven at 1:30 p.m. I will be interested to see how former Ansonia star Alex Thomas, who is pushing for duty as a backup tailback to Mike McLeod, looks as well as defensive lineman Jake Stoller, the most highly-touted player among the Yale freshmen if you believe recruiting services. With the exception of naming a starting quarterback, the two-deep chart is out. Yale coach Jack Siedlecki said he plans on picking between senior Ryan Fodor and sophomore Brook Hart by next week. If Fodor gets the nod, the only starter on the depth chart released at the end of spring camp who was bumped to second string is senior receiver Jarrett Drake. TB: Jordan Farrell, who was among three players listed in the spring, has been replaced by junior Brandon Scott and freshman Alex Thomas, who set the Connecticut high school career rushing record while at Ansonia. Ricky Galvez is still in the mix along with Scott and Thomas to be Mike McLeod's backup. Farrell (shoulder) and Galvez (hamstring) have been slowed by injuries during summer/fall camp. DE: Junior Travis Henry, who has been moved from defensive back, replaces sophomore Sean Williams as the reserve at right end. DT/MG: Converted quarterback Matt Kelleher is the No. 2 guy at right tackle in place of sophomore Pat Moran, who is now the top reserve at middle guard in the place of senior Shane Jones. CB: Sophomore Chris Stanley, a converted receiver, is the backup to Paul Rice at one corner instead of senior Brian Stephenson. SS: With Henry moving to defensive end, former running back John Pagliaro is the second on the depth chart to Larry Abare. Yale is 13 days away from its season opener but the Bulldogs' three non-conference opponents all opened up this weekend. Georgetown, which will play at Yale on Sept. 20, defeated Howard 12-7 on Sunday. Freshman James Brady and sophomore Keerome Lawrence, a former Hillhouse star, split time at quarterback. Brady was 12 for 20 for 131 yards including a 31-yard touchdown pass to Kenny Mitchell while Lawrence ran for 38 yards. Ataefiok Etukeren had two sacks and Chris Rau had nine tackles to lead Georgetown's defense. Holy Cross, which will visit the Yale Bowl on Oct. 4, nearly upset UMass - the fourth-ranked team in the Football Championship Subdivision preseason poll before losing 45-42 on a last-second field goal on Saturday. Former Pomperaug star Mike Kielt led the Crusaders with 51 yards rushing while Dominic Randolph passed for 239 yards and three touchdowns. Fordham, which will host Yale on Oct. 18, shut out Rhode Island 16-0 on Sunday. Former Bloomfield High star Andre Delaire had nine tackles while Ryan Mehra, Nicholas Magiera, Greg DeMarco and Ryan Darcey combined for seven sacks to lead a defense which held URI to 174 yards. Offensively, Xavier Martin ran for 169 yards and John Skelton threw for 267. The first meeting between Washington, D.C., schools Georgetown and Howard was postponed Saturday because of Tropical Storm Hanna. The game has been rescheduled to Sunday. Georgetown coach Kevin Kelly said the decision was made with the safety of the athletes and fans in mind. Kelly said the weather was expected to improve Sunday for what may become a great college rivalry for the nation’s capital. The game will be played at Greene Stadium on Howard’s campus. The schools agreed to a four-game series. Yale opens its season with Georgetown at Yale Bowl Sept. 20 at 12:30 p.m.
Holy Cross gave UMass all it could handle, falling 45-42 and allowing nearly 400 yards passing. Yale's other non-conference opponent, Fordham, is scheduled to play Rhode Island tonight at 6 p.m., but Hanna should cancel that. And how about Army falling to New Hampshire 28-10. The scrimmage against Princeton is in the books and if the statistics count for anything, deciding on the starting quarterback didn't get any easier for Yale coach Jack Siedlecki. Senior Ryan Fodor of Madison headed into camp as the No. 1 guy but he is being pushed hard by sophomore Brook Hart. Junior Rich Scudellari was also in the mix. Fodor was 4 of 6 for 122 yards including a 69-yard TD pass to Ken Eberling while Hart was 6 of 9 for 62 yards. Scudellari was 6 of 12 for 72 yards but threw two interceptions. Fodor is the most experienced of the QBs but no Yale player has made a bigger jump in play from the spring game to the current time than Hart. Eberling and Justin Forney (3 catches for 40 yards) were the top receivers while Brandon Scott had 50 yards rushing to lead all Yale running backs. Mike McLeod ran the ball four times for 12 yards while freshman Alex Thomas of Ansonia, the 2008 Register State Football Moat Valuable Player, ran for 34 yards on six attempts and had a reception. On defense, senior defensive lineman Kyle Hawari was nursing a tight quad and was iffy to play. But Hawari not only suited up but had three solo tackles including a sack. That is good news for the Bulldogs as a healthy Hawari will make a huge difference up front. Freshman defensive back Drew Baldwin, who had an interception, continues to impress. The team will sit through an extensive session breaking down the game tape on Sunday and after using Monday as the NCAA-mandated day off, the team will reconvene on Tuesday. The reconfigured two-deep chart figures to be finalized by either Tuesday or Wednesday as the Bulldogs begin preparations for the Sept. 20 season opener against Georgetown. With reigning Ivy League player of the year Mike McLeod back at running back, four starters back from the offensive line and tights ends continuing to impress, Yale's offense appears to be in good shape. The final pieces of the puzzle on the offensive side of the things should fall into place when Yale plays at Princeton in a scrimmage on Friday. Former Hand High star Ryan Fodor is currently the top guy at quarterback but he is being pushed by sophomore Brook Hart who Bulldogs' coach Jack Siedlecki has been the most improved player from the spring to the present time. Junior Rich Scudellari is also in the mix and the three will split time in the scrimmage. Receiver is another area that will be looked at closely by the coaching staff. "We really need some receivers to step up," Siedlecki said. "We used to travel with six and right now we don’t have six. That is one place where freshmen are going to play early." juniors Jordan Farrell and Ricky Galvez nursing injuries. Other freshmen who have been impressive are cornerback Drew Baldwin, linebacker Jordan Haynes and defensive lineman Jake Stoller. 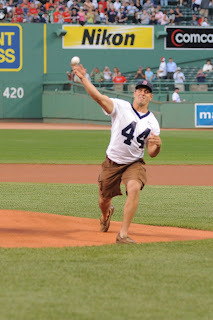 Yale senior linebacker and captain Bobby Abare threw out the first pitch at the Boston Red Sox game on Tuesday along with Harvard captain Matt Curtis. Abare, a former baseball player in high school, was a bit rusty and it showed in his delivery. "It was fun. It was a little nervewracking, I hadn’t thrown a baseball in a while but it was definitely fun, we got to meet some great guys. My result on the mound wasn’t what I had anticipated, I threw it over the catcher’s head." As for his counterpart at Harvard - "he short hopped it, he threw it into the dirt so that made me feel a little better." Bobby Abare throwing out first pitch at Fenway this week. Abare and Harvard captain, Matt Curtis, threw out the ceremonial first pitches at Fenway Park prior to Tuesday's game with the Orioles. The Red Sox honored the famous collegiate rivals to help promote the 125th playing of The Game on Nov. 22 at Boston. It is also the 40th anniversary of the 29-29 tie in 1968, listed by many sports publications as one of the most famous games in the history of college football. With a full week of full-contact practice in the books, the player who has made the biggest splash is sophomore quarterback Brook Hart. Among the other skill position players who have impressed the coaches are junior running back Brandon Scott, junior receiver Reid Lathan and sophomore tight end Chris Blohm. On defense, the biggest question mark heading into camp was the defensive line so Yale fans should be happy to hear that senior nose guard Joe Hathaway and junior defensive tackle Tom McCarthy have been impressive while sophomores Joe Young and Patrick Moran and senior Shane Jones have made substantial strides. Yale's two-deep chart is undergoing regular alterations and won't be set until after Friday's scrimmage at Princeton. With the release of tight end Nate Lawrie by the Cincinnati Bengals last week and tight end Eric Johnson being waived when the New Orleans Saints acquired Jeremy Shockey, there are no Yale players on NFL rosters for the first time since 1995.